Hey guys! Sorry I’ve been so MIA – I got completely sucked into my new job and was working around the clock. I’m now starting my own venture now, so I have some time to revive Crewlade. I thought I’d start with a round-up of my favorites for Spring. Right now I’m obsessed with pops of bold color against neutrals – I’m loving bright yellow, grass green, neon pink, and bold oranges, particularly against navys and whites. Ikat prints are also all the rage. What about you guys – what are you loving? Nautical is always a big theme for Spring/Summer, but it’s that way for a reason – it is always cute and fresh! 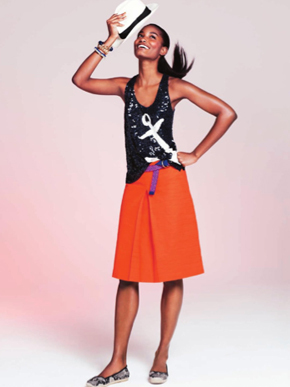 This Sequin Anchor Tank is comfy & casual yet effortlessly glam and very on-trend. Love! Buy it here at J.Crew for $98. 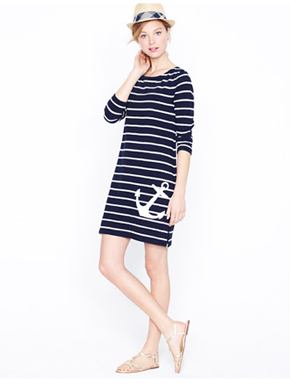 Keeping with the nautical theme, JCrew’s Maritime Anchor Dress is as comfortable easy to slip on as your typical sweats but way more on-trend. Throw on a cognac skinny belt & a statement necklace with a pop of yellow and you will look way more put-together than the 5 minutes you spend throwing it all on. Buy it here at J.Crew for $98. If you haven’t noticed by now, I’m all about looking good easily and comfortably. This Drawstring Tunic dress is right up my alley – comfortable, on-trend, and would look great with bright yellow sandals or bright yellow summer scarf. Buy it here at J.Crew for $88. I’m a huge fan of JCrew’s Vintage Cotton tees. I’ve tried many other basic tees at almost every store you can think of, and none drape as well as these, fit as comfortably, hold their shape, nor are as flattering as these. Plus they always hold their colors really well, staying vibrant even after many washes. This tank will go with everything and be comfortable while you stay looking sharp. Again, love it with pops of color. Buy it here at J.Crew for $29.50. If these were on sale, I’d buy them in every color! 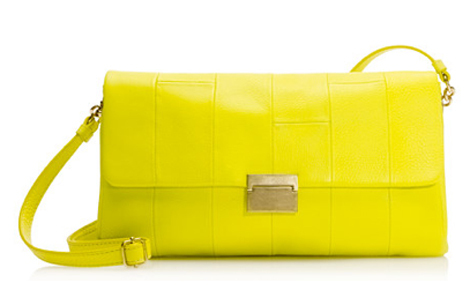 And here’s your pop of bright yellow for all your neutrals this Spring! 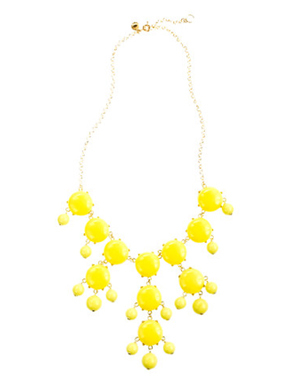 J.Crew’s bubble necklace is practically an icon now, so it perfectly combines a classic with the very on-trend yellow. Buy it here at J.Crew for $150. If you’re like me, as much as I love the Bubble Necklace in Citrus Lime, part of me – the lazy part – does not want to wear a heavy necklace on hot Spring/Summer days. Margate purse in Moroccan Yellow to the rescue! This is the perfect pop of color for any lazy person. I don’t usually need much when I go out – usually just my credit card (in a coin purse), keys, and my phone. If I could pop all those into a cross-body clutch and be hands-free, I’d look cute AND won’t have to hurt my shoulders carrying a real purse. Sweet. Buy it here from J.Crew for $198. Why isn’t there more Ikat in printed clothing? I love it in home decor and would love to see more in tops and skirts. This dress for example – why doesn’t it come in more colors? Would look amazing in navy, yellow, orange, pink….Anyway, buy it while you still can here at Loft for $49.50. This has been selling pretty quickly. Love this comfy-looking, belt-it-and-go dress for Spring – and in a very on-trend color. Not surprised this has been selling like hotcakes at Loft. Buy it here for $49.50. Ok, I basically love everything in this picture. Comfy, easy-fit yellow tee pops against the navy Ikat & a casual sky-blue dress with pops of yellow already built in. Can we say custom made for me? Buy them at the links below at Loft. Anyone buy any of these yet? Would love feedback.